Thistle Dew will close on Wednesday, Nov 26, at 2:00 p.m., and be closed Thanksgiving Day. 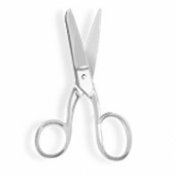 We will reopen for business on Friday, Nov 28, at 10:00 a.m.
Dean Ross will be here this Saturday, Nov 22, from 10:00 a.m. to 2:00 p.m. to sharpen scissors. Thank you so much to everyone who visited our booth at the River City Quilt Show this past weekend. We had a lot of fun seeing old friends and meeting new customers. Thank you also to Terry McFeely for demonstrating Terial Magic on Friday and Saturday. We carry Terial Magic and all of Terry's patterns and accessories in our shop now. There's still time to participate in our 5th Annual Stocking Challenge! Have your completed stocking back to Thistle Dew by November 30 to be make a child happy this Christmas and to compete for a Thistle Dew gift certificate. If you haven't bought your stocking kit yet, we still have some available. Please note that Quilters' University (Beginning) originally scheduled for Mon, Nov 24, has been cancelled. For the students who had signed up for this class, we will let you know the new date soon. Quilters' University (Continuing), Tue, Nov 25, 9:00 a.m. - noon -OR- 1:00 - 4:00 p.m.
Quilters' University (Continuing), Sat, Nov 29, 9:00 a.m. - noon -OR- 1:00 - 4:00 p.m.
Beginning Needleturn Applique (ongoing), Mon, Dec 1, 9:00 a.m. - noon -OR- 1:00 - 4:00 p.m. -OR- Tue, Dec 2, 9:00 a.m. - noon. BOM-Anniversary Waltz, Thu, Dec 4, 10:30 - 11:30 a.m. -OR- 5:30 - 6:30 p.m.
American Girl Doll Sit & Sew, Wed, Dec 10, 1:00 - 4:00 p.m.
Handwork Sit & Sew, Mon, Dec 15, 10:00 a.m. - 4:30 p.m.
Blankets for Preemies, Fri, Dec 19, 11:00 a.m. - 3:00 p.m.
Sue Spargo's Felted Wool Needlecase, Judy Cummings, Fri, Dec 5, and Sat, Dec 6, 10:00 a.m. - 2:00 p.m., $35 class fee, $25 for kit. Have you seen all of our beautiful felted wool sample projects and wanted to learn the techniques used to make these pieces? This is the class for you! 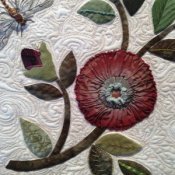 In these two sessions, you'll learn how to applique wool pieces to a wool background and then Judy will teach several beautiful, simple embellishment techniques. And, you'll have a unique, usable needle case! Bring scissors and a thimble, if you use one. Sue Spargo's Bird Dance, Judy Cummings, 2nd Tues (beginning in Jan 2015), $15, supply list. 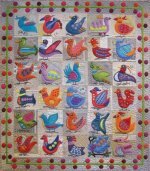 Judy will be teaching this colorful and charming wool appliqued and embellished quilt. You won't want to miss out on this. Judy's Sue Spargo classes always fill up quickly, so don't wait to sign up. Favorite Fans, Toni Jordan, Sun, Jan 11, 11:00 a.m. - 3:00 p.m. and Sun, Jan 18 & 25, 11:00 a.m. - 2:00 p.m., $75, supply list. 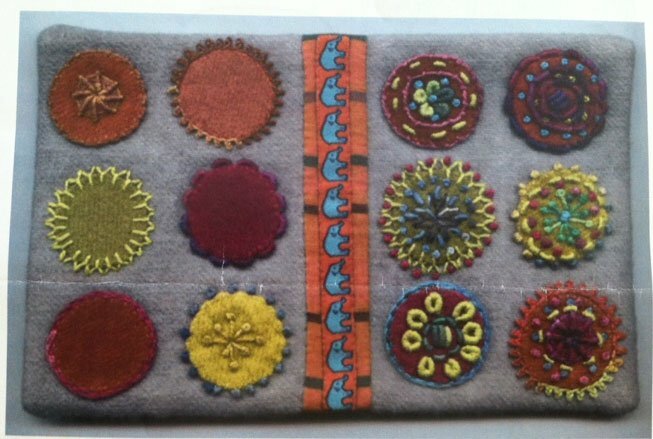 This beautiful wallhanging is from Jan Vaines' new book, Embroidery & Patchwork Revisited. 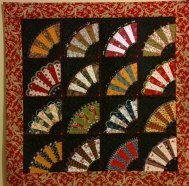 In the first class, Toni will teach you how to piece the fan blocks and start you on some embellishment stitches. 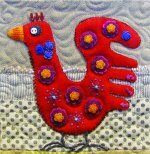 The next two sessions will be devoted to learning more embellishment stitches and fun tricks and techniques. We've received new blenders, yarn dyes from Robert Kaufman, blender flannels from In the Beginning Fabrics, and beautiful floral lawns from Moda. We also have many new rolls of toweling, including some very fun Christmas designs. Today we just checked in an adorable children's line--Love Me Teddy from Exclusively Quilters.